An Adelaide student’s ambition to commercially produce tonic syrup has been realised with the success of his $10,000 crowdfunding campaign. Two weeks ago InDaily published a story about Lindon Lark’s Pozible campaign to find the money to produce commercial quantities of Liru’s Snake Oil tonic syrup – a classic accompaniment to gin – using a recipe provided by his father, Kangaroo Island Spirits distiller Jon Lark. “Before the story came out the campaign was sitting on $1445, but as soon as the story came out 15 people started pledging small donations from $25 to $120,” says Lindon Lark. About halfway through the campaign, Lark says he received an email from Pozible explaining that he could expect the intensity of public interest to drop off, even slump, before momentum would be refreshed in the last few days. Although Lark set his campaign target for $10,000, he said could begin production with a minimum of $3500. “I needed $3500 to get the project off the ground, but now that I’ve got the full $10,000, it means I can purchase better equipment and set up an approved production kitchen at home. The extra cash also means Lark may be able to officially release his first batch in October, two months earlier than previously expected. As well as the cash, Lark’s campaign also generated a lot of interest and offers of assistance from within the food and beverage industry. “A lot of local gin distilleries offered their help and many bars have offered to stock the tonic syrup,” he says. Depending on the size of the pledge, individuals who made donations will receive rewards including bottles of the tonic syrup and gin, places at a gin blending masterclass, and invitations to the product launch. 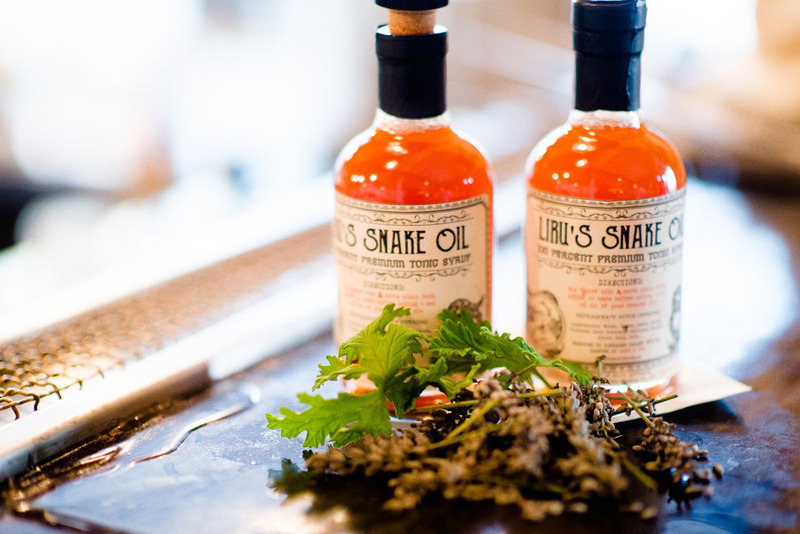 Liru’s Snake Oil tonic syrup on the bar at Hains & Co.